Camayak Blog | How Long do Your Assignments Need to be? How Long do Your Assignments Need to be? 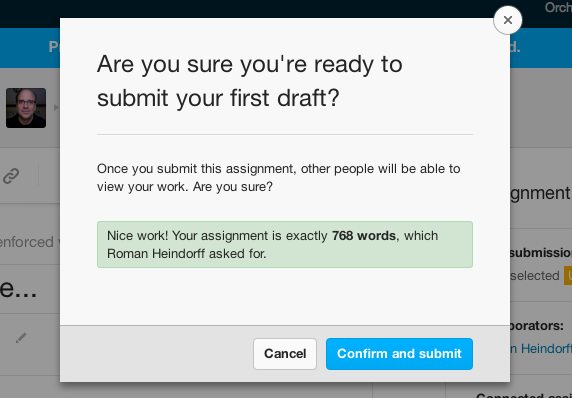 762 words. Out of assignments produced using Camayak that were shared at least 20 times on Facebook and Twitter in the last year, the average assignment was 762 words long. Whether you’re being paid per-word, fitting assignments into InDesign or simply looking to save time by specifying what the target is from the outset, word counts can be a big deal. That’s why today we’re launching word count control for editors and writers. The new word count control lets editors specify exactly how many words they want to receive as a first draft and prompts writers to pay attention to their word count as they compose their work. When submitting your first draft, Camayak will double-check for you to make sure you’re on target.